I’m always looking for tasty, healthy snacks for my daughter. This time I found a new one for me – Nature Valley Granola Thins! They are so delicious! I’m already familiar with the Oats ‘n Honey Crunchy Granola Bars. They are very tasty yet healthy at the same time. Based on this product, Nature Valley has now created Granola Thins. These provide the same flavor and crunch but now with peanut butter or dark chocolate. They are all-natural and do not contain high fructose corn syrup. They are the perfect size too – you just need one square to fill that ‘munchie’ feeling. Better yet, each square is only 90 calories so it’s a guilt-free snack. Nature Valley provides the full list of ingredients for the Dark Chocolate and the Peanut Butter Granola Thins. Roast marshmallow over open flame until it turns golden brown. Select two dark chocolate Granola Thins. Try the peanut butter flavor as a tasty alternative. You can even use one of each! Place the marshmallow inside the two thins, granola side out, and enjoy! These are not tidy car-snacks for the kiddies though. They are quite crumby and if it is any warmer than room temperature, the topping sticks a bit to the paper insert. Despite this, these will be a staple in my house and my car from now on. 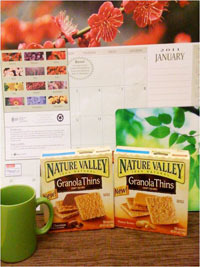 One reader will win a special Nature Valley Prize Pack which includes a nature-inspired mug, mouse pad, desk calendar, and 2 boxes of Nature Valley Granola Thins (one of each flavor). Visit Nature Valley and tell me which bar or snack is your favorite. “Like” Nature Valley on Facebook and tell them Cookies & Clogs sent you! Disclosure: I was provided with a 2 boxes of Nature Valley Granola Thins at no cost in order to test the product. The review presented here is 100% my honest opinion. The Apple Crisp Crunchy Granola bar is my favorite! Oats & Honey are a favorite around here. Granola Nut Clusters is my favorite product! I like the Sweet & Salty varieties, but nothing beats the original oats n honey. I would like to try the chocolate granola thins as a Smore! I like Nut Lovers Clusters. My favorite would be the Dark Chocolate Granola Thins….yum! 🙂 Thank you. I like Nature Valley on FB – Janet Fri and I left the message. I love their new Nut Clusters. I like the Chewy Trail Mix Bars–especially the Apple Cinnamon! I like NV on FB and told them you sent me. My favorite is the Apple Crisp Granola Bar. roasted almond nut clusters – yum! I like the Almond Sweet & Salty Granola Bars. the Oat’s ‘N Honey bar sounds tasty. i follow Nature_Valley on twitter. I recently tried the Peanut Butter Thins and they are awesome! I love the oat and honey bars. They’re so great on snowmobiling trips. I love the Nature Valley Nut clusters. I like the Peanut Butter Granola Bars. I just ate my favorite, the Oats and Honey granola bars! We love their peanut butter granola bars. I really like their Sweet & Salty Bars – especially cashew! The Chewy Granola Bar with Strawberry Yogurt. So good for a snack. I love crunchy Oats and Honey. Hope I win — I’m hungry! I “like” Nature Valley on Facebook. I like the NV Oats and Honey Granola Bars. I follow cookiesandclogs as wiscmom24 on Twitter. I follow Nature Valley as wiscmom24 on Twitter. My favorite Nature Valley bar is the Oat’s “N Honey Crunchy Granola Bar. I love the Roasted Almond Nut Clusters! The Sweet and Salty Nut Granola Bars (Peanut flavor) are my favorite. I like the crunchy peanut butter granola bars. I’ve never seen the Apple Crisp flavor of crunchy granola bar before. Liked Nature Valley on Facebook (Priceless Writers) and left a message. Following Nature Valley on Twitter (pricelessteam). The Sweet and Salty Peanut granola bars are my favorite. I have LOVED their Oats ‘N Honey bars for as long as I can remember! I would like to try the Sweet & Salty Cahew Nut Bars. 1. I subscribed to your newsletter. 2. I subscribed to your newsletter. 3. I’m a new email subscriber. I love the Dark Chocolate Nature Valley Granola Thins! I’m an email subscriber as Chanticlear1! I like the Fruit & Nut trail mix bars! I love the Crunchy Peanut Butter Granola bars because you can see actual peanut butter on them! I like the Sweet and Salty Nut Granola Bars. I like maple brown sugar! I like maple brown sugar flavor. My favorite is the sweet and salty peanut bars. My favorite Nature Valley bar is the Sweet and Salty Cashew bars. Yummy! I love the Blueberry Yogurt bars! So yummy! I love the Roasted Cashew Nut Clusters (they are addicting). Dark Chocolate would be my favorite! I really like the new Peanut Butter Granola Thins. We really like the Sweet and Salty Nut Bars, cashew flavor. I choose Nut Lovers Nut Clusters. I like a lot of their other products but my fav is the Clusters. I love the Oats & Honey Granola Bars! Love Nature Valley Crunchy Granola Bars in Apple Crisp!! “Like” Nature Valley on Facebook and posted!! I haven’t found a Nature Valley bar I don’t like, but I suppose my favorite would have to be the Cranberry & Pomegranate Chewy Trail Mix bar. Thanks. I would like to try the cinnamon granola bars. Thanks! My favorite is the Sweet & Salty Nut Granola Bar. I am a fan of Nature Valley via Facebook as Jill Myrick and have left a comment. I am following Nature Valley via Twitter as jlsc123. I would like to try the Granola Thins. My favorite are the Nature Valley Oats and Honey bars. The peanut Butter Crunchy Granola bars are the best! Already a fan of Nature Valley on FB so left a new message on the wall. My personal favorite Nature Valley bar is the Trail Mix Variety Pack. My favorite is the Almond Sweet and Salty nut bars. The Peanut Butter Crunchy Granola Bars would be my choice! I love the cinnamon granola bars! I like the Fruit and Nut Trail Mix Bars. I like the Almond Sweet and Salty nut bars. The Granola Nut Clusters Roasted Almond is my favorite. Thanks for the giveaway…our favorite are the Nature Valley Chewy Granola Bars with Yogurt Coating. I get them at Target or Safeway.